One of the best ways to enhance a tweet or a Facebook post sharing your website is to add an image. Not only does the post look better, but it also increases engagement. For example, tweets with images are twice as likely to be retweeted. In situations when there's no obvious picture to show for your website, the easiest thing to do is to display a screenshot of your website (which is what we do with the Thum.io homepage). The tweet with the image stands out much more! Because this use case is so popular, we made it really easy to do with a Thum.io URL. By adding the /ogImage/ option, the screenshot will be resized to the size requested by Facebook's Open Graph protocol. The same image also works for tweets. That’s all the code it takes to get set up! 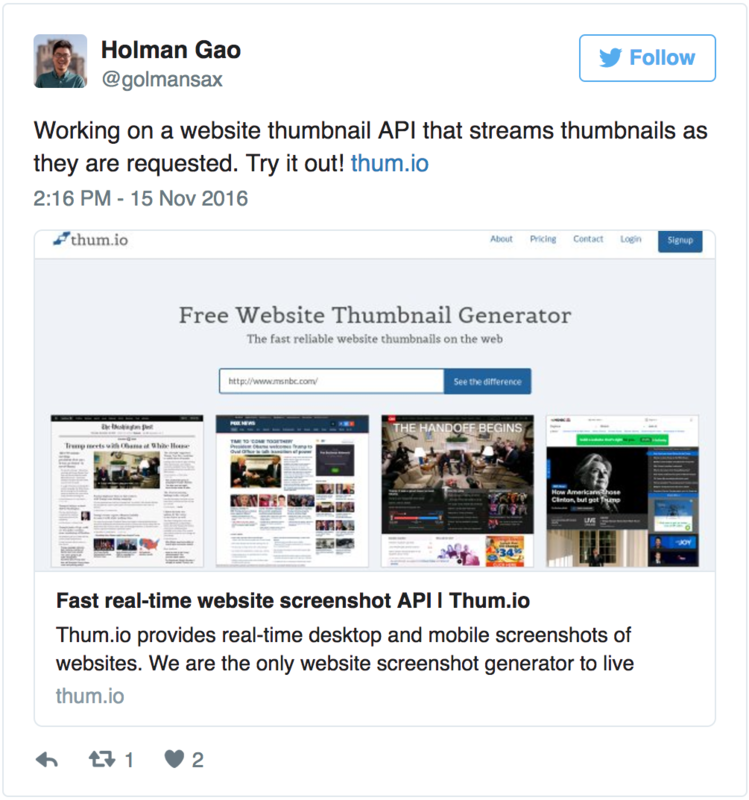 Get started with Thum.io for free to start generating your screenshot share images. Feel free to email support@thum.io if you have any questions.